Also known as White Prawn or White Shrimp. Banana Prawns are large, white prawns. They have poorly defined gastro-orbital ridge and high toothed rostral crest. Their body is pale yellow or translucent and speckled with reddish brown dots. Banana Prawns inhabit tropical and subtropical waters. Banana prawns inhabit coastal waters from shallow estuaries and intertidal areas to a maximum depth of 45 metres. They live in turbid waters for most of their lives, over muddy substrates in estuaries and muddy sands offshore. Juveniles inhabit small creeks and rivers in a sheltered mangrove environment in waters ranging from almost fresh to high salinity. Adult banana prawns inhabit medium and low energy coastlines, although they can withstand high energy cyclonic events. In northern Australia, schools of adults frequently occur in depths between 16m and 25m. They also form aggregations which in some areas become extremely dense and are known as "boils"
Banana Prawns can become sexually mature at about 6 months of age. Spawning occurs throughout all of the shallow coastal zone inhabited by adults and older adults may migrate shorewards at the time of spawning. Mating occurs during moulting. Eggs are shed into the water prior to the moult and are fertilised externally by sperm from the male. Did you Know? Females can lay between 100,000 to 400,000 eggs, and can be laid in several batches. The maximum life span is approximately 12-18 months. How to Purchase the Freshest Prawns or Shrimp - Fresh cooked shrimp are actually cooked on board the vessel of capture the moment they are caught and then refrigerated for maximum freshness before being delivered to the markets which will be normally or hopefully within 24hrs of capture. 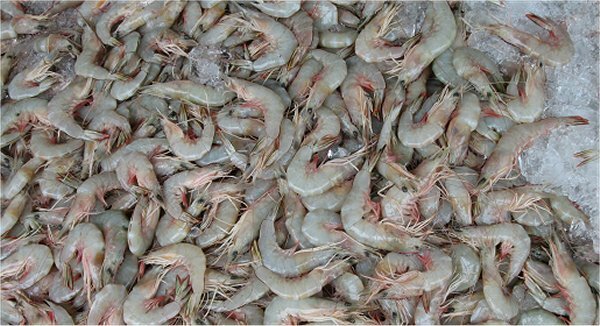 S & B = Soft and broken prawns - these are export 2nds due to slight damage or soft shell due to prawn malting just prior to capture. Available both wild-caught and farmed, these are mostly marine dwelling Prawns with juveniles sometimes found in sheltered estuaries and rivers, usually among mangroves. They are found over muddy and sandy bottoms in coastal waters to depths of 90m (Redlegs preferring slightly deeper water than Whites). Found around the northern coast of Australia from the NSW-Queensland border to Shark Bay in WA, they are mainly caught by trawlers between Exmouth Gulf, WA and Brisbane, with the bulk of the catch coming from the Gulf of Carpentaria. They are translucent to yellow in colour with tiny dark spots. The 2 species differ in leg colour: Whites have cream to yellow legs and Redlegs have pink or red legs. Available year round with peak supply in April. The fishery is closed from December to March and again in July in NT, and from December to February in WA. Commonly 20-30g and 14-17cm body length, but can grow to 75g and 25cm. Redlegs are slightly smaller than Whites. Banana prawns are a rising favourite for Australians due to their light, sweet flavour. They present well as they retain their shape when cooked. Banana prawns are more commonly used in hot dishes rather than in cold salads or platters. The traditional cooking methods for other species of prawn (such as shallow frying and barbecuing) can be used for banana prawns. They are also ideal for use in seafood dishes such as prawn cakes or terrines. A favourite in Asian dishes, banana prawns are well suited to spicy flavours. Chilli jam is an excellent accompaniment. Thai-style coconut curries and avocado cocktails are also a delight. Banana prawns are medium-priced prawns. Redleg banana prawns cost more than white banana prawns because of their brighter colour and larger size. 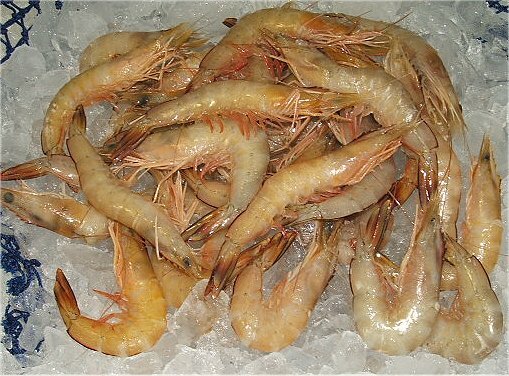 Banana prawns are an economical alternative to the king prawn species. Banana prawns are mostly caught during the day, and in some areas good annual catches are linked with heavy rainfall earlier in summer. How to cook raw prawns to eat or use in a recipe that calls for cooked prawns. Sydney Fish Market provides step by step instructions on how to peel a 'green' or raw prawn perfectly! The commercial fishery for Banana Prawns is one of Australia's most lucrative single species trawl fisheries. The main fishery is centred on the Gulf of Carpentaria and operates from about April through May. The main capture method is demersal otter trawling. Other methods include beam trawling, pocket netting and beach seining. Banana prawns are caught year round, with peak supply in April. 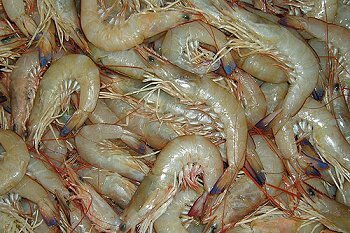 The banana prawn fishery is closed from December through March and again in July in the Northern Territory. In various trawl fishery closures occur. Exporters of all seafood caught in Queensland waters. Frozen: scallops, king prawns, coral trout, spanner crabs. Live: spanner crabs, mud crabs. Chilled: whiting, mackerel, reef fish.